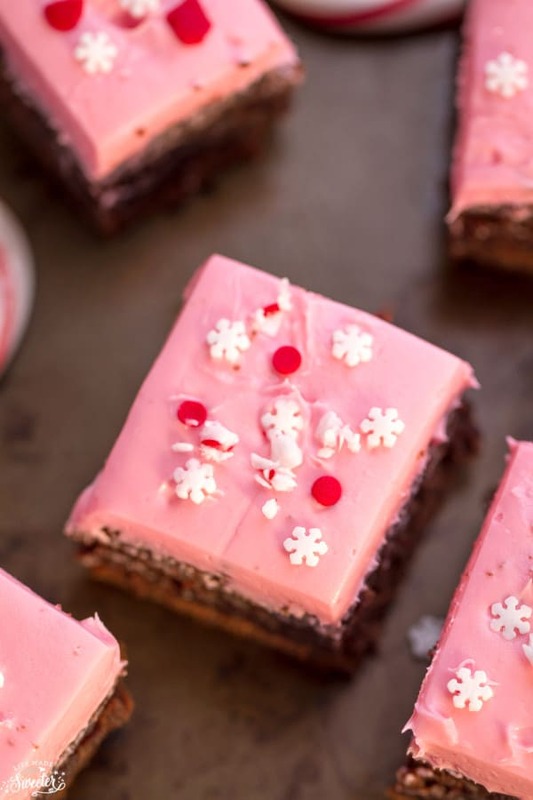 Peppermint Frosted Brownies are the perfect holiday treat. 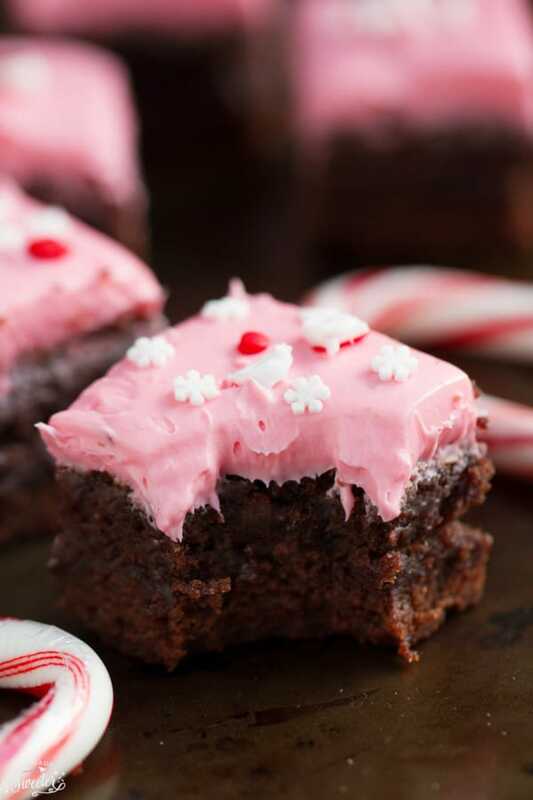 A fudgy brownie with a peppermint cream cheese frosting topped with crushed candy canes. 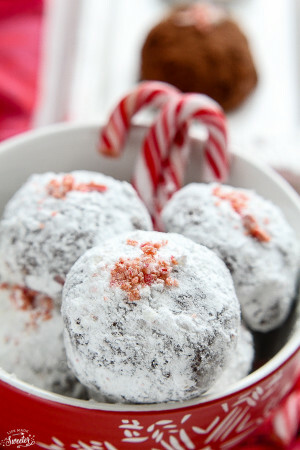 One of our favorite holiday flavors is chocolate and peppermint. It just screams Christmas and we can’t get enough once December rolls around. 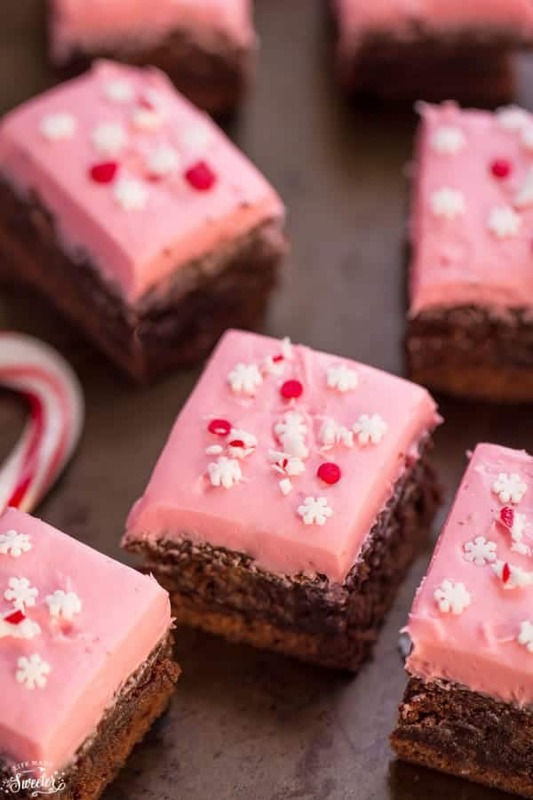 These Peppermint Frosted Brownies were one of the treats we made to take along to a friend’s house and they are now our new favorite brownies ever. They are super fudgy & delicious and when paired with the sweet, refreshing peppermint frosting – it makes an irresistible treat! Chocolate and peppermint are perfect together and even our friends have now declared these the best brownies ever! 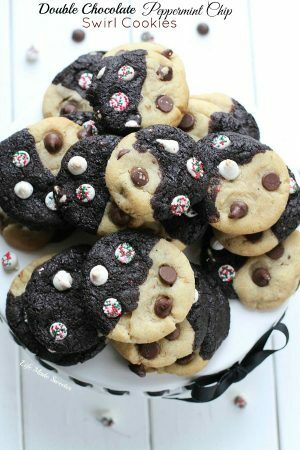 They’re so easy to make and perfect for taking along to a holiday party or family gathering. 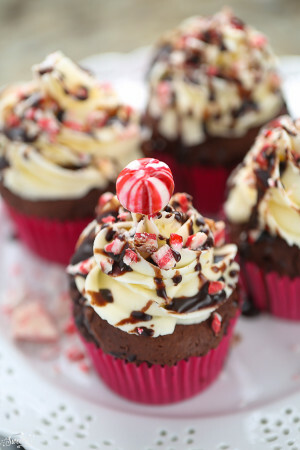 Chocolate cocoa brownies frosted with peppermint cream cheese frosting sprinkled with candy cane pieces. These festive treats are a great kick start into the holiday baking season. Line a square 8x8 pan with parchment paper leaving a 2" overhang for easy removal. Set aside. Place butter into a large mixing bowl and microwave until melted. Whisk in sugar and oil and mix until well combined. Whisk in eggs slowly, one at a time, and vanilla stirring until combined. Slowly fold in the flour mixture with a spatula until just combined. Fold in chocolate chips and chopped peppermint crunch thins. Beat cream cheese and butter at medium speed with an electric hand mixer or stand mixer until creamy. Gradually add sugar and melted Hershey's Kisses, beating at low speed until smooth. To make the frosting pink, add a drop or two of pink food gel coloring. Spread frosting over brownies evenly with an offset spatula. Sprinkle with chopped candy canes and festive sprinkles if desired. Frosted brownies can be stored in airtight container in fridge for up to 3 days. Looking for more ideas for holiday desserts?